Size：1164mmW x 341mmD x 115mmH w/o cover and case moldings. 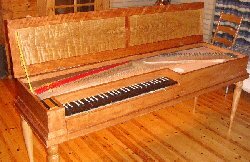 The compass of the original clavichord, C to c3, is expanded to C to d3 by fretting and no string pair is added. Drawings by Ute Singer, 2007 for a similar instrument, Henkel cat. no. 2　1540. Page 56 to 62 of The Clavichord by Bernard Brauchli. 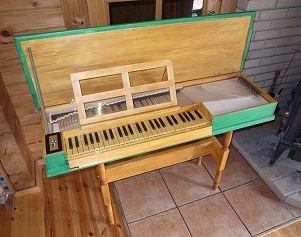 Earliest extant clavichord, kept at Leipzig University Musical Instrument Museum. Repertoire is limited to the pieces of this period, as some of the notes are 4-fretted. The original compass of C to c''' is extended to GG to d'''. GG is located next left to C and AA/HH are on the back of the split sharp keys of C#/Eb. The sound board bridge stretches very close to the spine and the sound board is sandwiched between the bridge and the liner. It seems to effectively contribute to nicely spread the high frequency sound energy to whole body of the instrument. 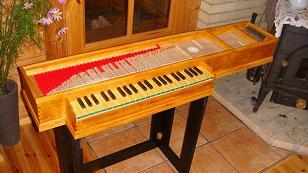 Presently, four clavichords made by C. G. Hubert in 1784 are found (K. Vermaiji). The original instrument, on which this replica was made, is the one kept in Edinburgh. 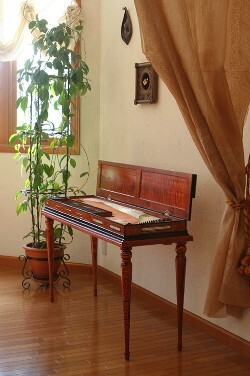 Other three clavichords made in the same year are also fretted type, but all of them have the compass of C to g'''. There are no stabilizing braces on the baseboard. 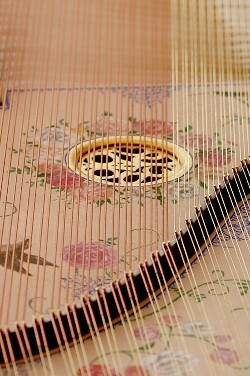 which are often seen in similar type of instruments. 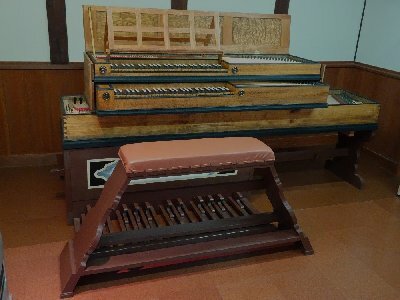 On making this replica instrument, I would like to express special gratitude to Mr. Markus Brosig at the Leipzig GRASSI Musical Instruments Museum for arranging opportunities to closely study the original instreuments.